Our websites offer the very best in content management and design. State of the art websites to meet art world needs. 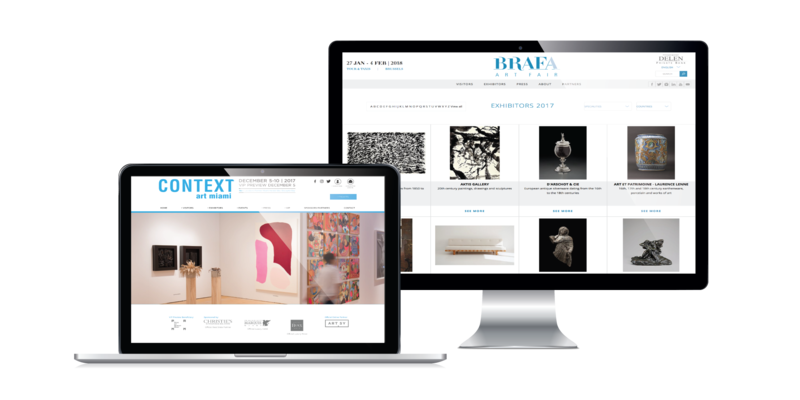 We work closely with clients in the arts (galleries, art fairs, associations or institutions) to produce customised websites that are sophisticated, easy to use and to up to date with the latest technological trends. Our websites are tailored to suit each clients’ specific brand and needs, and look fantastic across all platforms – mobile, tablet and desktop. With our secure Content Management System, managing and updating your site has never been easier. Add, edit or delete any content on your site. No technical skills required. Our sites are simple to use for all computer skill levels. Store your data in one secure location. All ArtSolution websites are fully integrated with our in-house art world management software, AS Fair Manager, to make keeping track of your data simple and efficient. Reach users in several languages. Our websites can accommodate multiple language versions. To guarantee our clients’ websites remain competitive in the rapidly changing technological environment, ArtSolution offers regular technical upgrades to its sites. ArtSolution offers unlimited technical support, via email and telephone, during business hours. Our team is always eager to respond to any of your concerns. We provide secure hosting solutions of the highest quality, ensuring your site’s high availability and worldwide connection speed.